"This is an extremely healthy drink I have almost every morning and great on detoxes as you get all your needed nutrients. You just have to play around to find the perfect drink. I find if you add beetroot, it makes it a fantastic color and gives extra flavor. To get the full benefit of the flavor, swish the juice around in your mouth; this is where lots of nutrients are digested. Enjoy!" 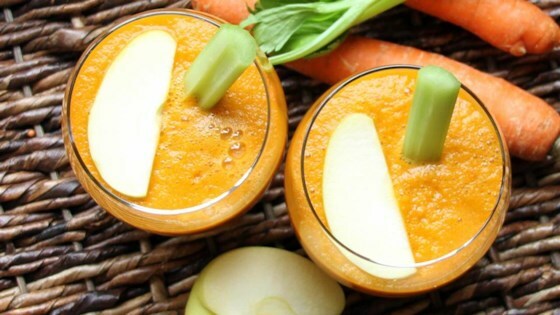 Run carrots, apples, and celery through a juicer (alternating carrot, apple, and celery) according to manufacturer's instructions. Add ginger to juicer and process. A light and refreshing juice with lemons, apples, and cucumber. I loved this juice. The ginger adds a kick to the drink. It's naturally sweet and refreshing. Love this juice perfect for my new life style change! Love the flavor, not bitter, juice delicious! So delicious! Really love this recipe. I’ve made it twice following the directions to a T and it has turned out great both times. I had left over carrot juice so I gave this a try. Very tasty, though depending on how much you like celery you might want to lighten up a bit on that.